MakeMyTrip team working with innovatively with the passion for serving its customers brings in new ideas to promote the business and serve the people efficiently. MakeMyTrip latest coupons are designed in view of the customer needs. MakeMyTrip corporate travel program makes it easy and economical for the companies to plan their travel needs. Login your MakeMyTrip account. Choose to make hotel or flight bookings. Give the required details. Click on the search button to obtain the list or available hotels or flights available as per your requirement. Choose the hotel or flight of your choice and make the booking. Choose to make payment using your Mobikwik wallet. Confirm the booking and make the payment. The cashback amount will be credited to your MakeMyTrip wallet. MakeMyTrip is giving 10% cashback on flight or hotel bookings for Mobikwik customers. This MakeMyTrip Wallet offer is easy to redeem. You can find these type of discount deals in Goibibo also, To get those deals check Goibibo Flight Offers and save more. The offer is valid only on transactions made using Mobikwik wallet. The cashback amount credited to the MakeMyTrip wallet has to be redeemed within 90 days of receiving the amount. The cashback amount can be used only on flight or hotel bookings at MakeMyTrip but cannot be withdrawn. MakeMyTrip is offering a wonderful cashback offer on domestic flights on Tuesday between 4 PM to 10 PM and get a cashback of Rs.1000. Open the MakeMyTrip mobile application. Choose to make a domestic flight booking. Give the required details such as departure and destination location, the number of adults and children and other details required to complete the transaction. Give the MakeMyTrip promotions coupon code FLYNOW to avail the cashback offer. Choose to make the payment using your HDFC credit or debit card or net banking only. The cashback amount of Rs.1000 will be credited to your MakeMyTrip wallet. Cash Back amount of Rs.800 will be credited to the MakeMyTrip wallet for other modes of payment. MakeMyTrip discount coupon for domestic flights is valid only on Android and iOS app on Tuesday’s. The minimum booking value has to be Rs.4500 to avail the offer. Each user can avail the offer only once. The cashback amount will be credited to the MakeMyTrip wallet within 21 days of making the booking. Like Makemytrip, Cleartrip also offering cashbacks domestic flight bookings. To grab those discounts check Cleartrip Domestic flight Coupons and get more. The offer is not valid on HDFC Bank corporate, commercial and netsafe cards. Cashback amount will not be given if the customer cancels the flight booking. Cashback is also not applicable on flights cancelled by the operator. Book your international flight to Srilanka at MakeMyTrip for just Rs.13,990. The customer can enjoy the vacation to Srilanka at discounted price with this offer. Open your MakeMyTrip account. Choose to make international flight bookings. Give the required details such as date of journey, departure place, the number of adults and children for whom the bookings have to be made, class i.e. economy or business. Click on the search flights. Select from the available flights that suit your requirements. No MakeMyTrip promo code is required to avail the offer as the flight bookings price for Srilanka after making discounts. Make the payment. The cashback amount will be credited to your MakeMyTrip wallet. If you still searching for more discounts, then simply check Yatra International Flight Offers and save more on you’re trip. The offer is valid only international flight bookings made to Srilanka. The Srilanka offer is valid only for two persons sharing the room. MakeMyTrip can change the itinerary or the price of the trip at any time. The MakeMyTrip flight coupons have to be used in single without combining with other offers. MakeMyTrip is not responsible for any expenses incurred by the customer due to cancellation, rescheduling of flights. MakeMyTrip provides alternative accommodation arrangements at hotels of the same class as chosen by the customer if the accommodation is not available at the specified hotel. Refund on the cancellation of the trip is as per the hotel’s cancellation policies. MakeMyTrip with HDFC is offering a cashback offer on international flight bookings for HDFC customers. The cashback amount can be up to Rs. 4000 depending on the booking amount.Log in MakeMyTrip account. Choose to make an international flight booking. Give the required travel details. Click on the select button to obtain the list of available options. Pick from the available options and make the booking. 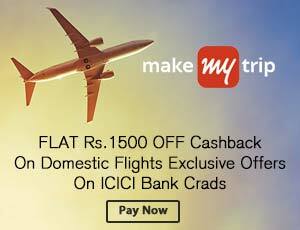 Give the MakeMyTrip offer code HDFCIF to avail the cashback offer. Choose to make the payment using your HDFC credit or debit card or net banking. Not only HDFC bank users, Makemytrip offering different discount deals on Banks. To check those deals visit MakeMyTrip Bank Offers. The offer is valid only on transactions made using HDFC credit or debit cards or net banking. The offer is valid only if the minimum booking value is Rs. 15000. The cashback amount varies with the booking value but the maximum amount of cashback that can be obtained is limited to Rs.4000. The cashback amount is credited to MakeMyTrip wallet. The amount credited to the MakeMyTrip wallet has to be redeemed within 90 days of receiving the credit. Each user can avail the offer twice in a month. Pros: Get Exciting Discount Offers On Every Flight Booking. With this Discounts You Can Book Tickets with in the Budget. The Services Offered by MakeMyTrip Includes International Hotel Bookings and More at Best Price. Login your MakeMyTrip account. If you are new to MakeMyTrip download their mobile app and register at the website. Choose to make hotel plus flight booking. Give the required travel and hotel details. Click on the search button to obtain the list of available flight and hotel options. Pick the best one that fits your requirements. Make the bookings. Give the coupon code INDFPH. Choose to make payment using your Indusind bank debit or credit card or net banking to avail the 10% discount. MakeMyTrip is offering 10% cashback of up to Rs.2000 on flight plus hotel bookings for Indusind bank customers. Plan your trip with MakeMyTrip using your Indusind debit or credit card or net banking to avail the 10% discount. The offer is valid only on transactions made using Indusind debit or credit card or net banking. The minimum transaction value has to be Rs.12000 to avail the cashback offer.Not only cashback offers, If you’re searching for discount offers then check Oyo Rooms Hotels Coupons and save more on hotel booking. The maximum amount of cashback that can be obtained is limited to Rs.2000. The cashback amount will be credited to the MakeMyTrip wallet. The cashback amount has to be redeemed within 90 days of credit. MakeMyTrip is offering a cashback of Rs.1750 on hotel bookings for HDFC Bank customers. HDFC bank customers can make domestic hotel bookings at MakeMyTrip using the HDFC credit or debit card and enjoy the cashback offer. Customers can get extra Rs.250 cashback by using MakeMyTrip mobile app for their hotel bookings. Login MakeMyTrip website or open the MakeMyTrip mobile application. Choose to make hotel bookings. Provide details such as city, area, check-in, check-out, number of nights, the number of adults and children for whom the booking has to be made, and the number of rooms required. Click on the search hotels button. Select from the available list of hotels. Give the MakeMyTrip coupons code HDFCHOT to avail the cashback offer. Choose to make the payment using HDFC credit or debit card or net banking to get Rs.1750 cashback. Use the mobile app to get extra Rs.250 cashback. The offer is valid only on transactions made using HDFC credit or debit card or net banking. The maximum amount of cashback that can be obtained per transaction is limited to Rs.1750. The cashback amount will be credited to the MakeMyTrip wallet created under the email ID provided by the customer at the time of making the bookings. The cashback amount has to be redeemed within 90 days of receiving the cashback. The cashback amount cannot be withdrawn by the customer. The cashback amount can be used on future transactions at MakeMyTrip. MakeMyTrip, one point to plan your trip, make the flight, bus, rail and hotel bookings offers great discounts on all its services giving huge discounts for the customers. 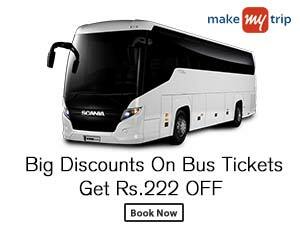 MakeMyTrip is offering a discount of up to Rs.222 on bus bookings. Login to MakeMyTrip website. Choose to make bus booking. Give the departure and destination places, date of journey and number of adults and kids travelling. Click on the search for bus button to get the list of available options. Get the appropriate MakeMyTrip promo code for bus available here and provide at checkout to avail the discount. Make the payment. You can also redeem available loyalty points if any. Like Makemytrip, Abhibus also offering discounts on bus tickets.To grab those discounts check Abhibus Coupons and enjoy your trip with lesser price. The minimum booking amount has to Rs.600 to avail the discount. The offer is not valid on bus bookings clubbed with hotel bookings. The offer is valid only online payments. Cash on delivery and payments made through PayPal account are not eligible for the offer. The offer should not be clubbed with other offers. If the customer cancels the bus booking then the discount provided to the customer will be reverted and the customer has to pay cancellation or penalty charges if any. If the customer reschedules the bus booking then the difference in fare if any has to be paid. MakeMyTrip mobile app lets you plan your travel on the go. MakeMyTrip app download is available for free and is very easy to install the app. Start using the app and you can complete the required travel arrangements in just a few clicks from anywhere. The company working with the passion for dominating in the travel services market provides best customer service around the clock. MakeMyTrip unlimited refer and earn is a wonderful program that lets you earn money very easily by referring friends to MakeMyTrip. Just share the referral code provided in the refer and earn section of your account and be on your way to make money. Download the latest version of Android or iOS mobile,Window app of MakeMyTrip. Login your account. Check refer and earn section and share the MakeMyTrip referral code or the referral link with your friend. You will earn Rs.500 cash when your friend downloads the MakeMyTrip mobile application using your referral link and 10% of the transaction value when your friend makes the first booking. Your friend, the referee gets the Rs.1500 bonus cash in their MakeMyTrip wallet when they sign up and install the MakeMyTrip application. The offer is valid only on MakeMyTrip iOS and Android applications. The refer and earn program lets you refer as many friends as you wish but the amount of cash you can earn is limited to Rs.4000. The cash earned must be redeemed within 90 days of receiving the amount. The cash earned can be used to make hotel or flight bookings on MakeMyTrip mobile application for Android or iOS. MakeMyTrip can change the amount of cash that can be earned at any time. Download MakeMyTrip app for your mobile and get Rs.200 cashback. You can also enjoy exclusive MakeMyTrip app offers by using the app for your hotel, flight and bus bookings.If you want more offers like these check RedBus App Coupons and get more discount. They also giving new user wallet cash and offering deals on both hotels & bus tickets. In addition to obtaining heavy discounts you can also, enjoy speedy booking process by using the app. Download the app and start planning all your upcoming tours on the go. MakeMyTrip first app booking coupon will give you an opportunity to save on your first booking. Use the MakeMyTrip discount vouchers codes sent to your mobile at the time of making the booking and enjoy great discount and cashback offers. The app is easy to download and is available for free. Just click on the download app link provided in the site and follow the steps as provided. You can start using the app immediately after completion of the installation and registration process. Pros: User Friendly App Easy To Book Flight Tickets and Hotels With Discount Fares. MakeMyTrip uses the Secured Socket Layer technology to ensure safety and security of online payments. It provides multiple payment options. Customers can make online payments using the credit or debit card or through net banking. MakeMyTrip My wallet makes payments easier. Deposit cash into the wallet and you can use it directly at the time of booking without the pain of providing credit card details every time you make the payment. MakeMyTrip is offering cashback on domestic hotel bookings. You can get 15% cashback of up to Rs.1500 on your domestic hotel bookings. You can also grab an extra Rs.250 cashback by booking through MakeMyTrip mobile app.Login to MakeMyTrip website or open the MakeMyTrip mobile app. Choose to make domestic hotel bookings. Give the required details such as the city, area, check-in, check-out, the number of nights, and the number of rooms required. Click on the search button to obtain the list of hotels. Choose from the list of available hotels. Give the coupons code MakeMyTrip hotel coupons code ICDOMHOT to get the 15% cashback. Choose to make the payment using your ICICI debit/credit card or net banking. Make the payment. The cashback amount will be credited to your MakeMyTrip wallet. The offer is valid only for ICICI Bank customers using ICICI Bank credit or debit card or net banking for their hotel bookings at MakeMyTrip. The maximum amount of cashback that can be availed per transaction is limited to Rs.1500. The cashback amount will be credited to the MakeMyTrip wallet created using the customer email ID provided at the time of making the booking. The cashback amount has to be redeemed within 90 days of receiving the credit. The cashback amount is non-refundable and the customer cannot redeem the cashback amount. 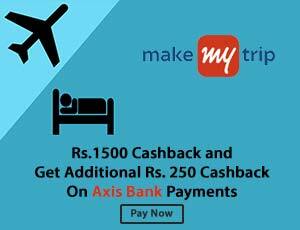 MakeMyTrip is offering cashback of Rs.1500 on international hotel bookings for Axis Bank customers. Customers using MakeMyTrip mobile application can get additional Rs.250 cashback. If you are new to MakeMyTrip download the mobile app and register at the website to create your MakeMyTrip account. Choose to make international hotel bookings. Give the required details such as the city, check-in and check-out timings, date, the number of rooms and other required details. Click on the browse hotel option. Choose from the available list of hotels. Make the hotel bookings at the hotel of your choice. Choose to make payment using your Axis Bank credit or debit card or net banking. The cashback amount will be credited to your MakeMyTrip wallet. The offer is valid only for customers using Axis Bank credit or debit card or net banking option. The maximum amount of cashback that can be obtained per transaction is limited to Rs.1500 or 10%. The cashback amount credited to the MakeMyTrip wallet has to be redeemed within 90 days of receiving the amount. The cashback amount cannot be withdrawn. MakeMyTrip with Kotak Bank is offering exclusive deals on flight bookings, hotel bookings and holiday bookings. Kotak Mahindra Bank customers can avail cashback of up to Rs.800 on domestic flight bookings. Cashback of up to Rs. 4000 is being offered on International flight bookings. MakeMyTrip Kotak offers save you even on your hotel bookings. You can get up to Rs.1500 on International and domestic hotel bookings. Hotel booking can be made even cheaper by using MakeMyTrip mobile application. You can get a cashback of Rs.250 by using the mobile app for hotel bookings. Kotak Mahindra Bank customers can also save on domestic and international holiday bookings. MakeMyTrip is offering a cashback of up to Rs.2000 on holiday bookings made online and a cashback of up to 1500 on offline holiday bookings made through call centers and retail stores. Similarly, Kotak Mahindra Bank customers can get a cashback of Rs.75 on bus bookings. Login you MakeMyTrip account page. If you are new MakeMyTrip download their app and register at the site giving the required details. Choose to make hotel, flight or holiday bookings of your choice. Give the required details and make the bookings. Get the MakeMyTrip Kotak offers coupon codes available at (site name) and provide it at the time of checkout. Choose to make payment using your Kotak Mahindra Bank debit or credit card or through net banking. The cashback amount will be credited to your MakeMyTrip wallet after processing of your order. Offer on hotel bookings is not valid on pay at hotel option and selected hotels. The offer is valid only on transactions made using Kotak Mahindra Bank debit/credit/ or net banking only. The cashback amount except for offline bookings will be credited to the MakeMyTrip wallet. 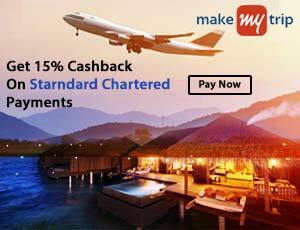 MakeMyTrip with Standard Chartered Bank is offering 15% cashback on domestic hotel bookings for Standard Chartered customers. You can get an extra Rs.250 cashback by making your bookings through a mobile app. Open your MakeMyTrip mobile application. Choose to make domestic hotel bookings. Give the required details. Click on the search option to get the list of available hotels at the selected city and area. Pick from the available list of hotels. Make the booking. Give the coupon code SCHOT to avail the cashback offer. Choose to make payment using SC credit/debit card or net banking. The cashback amount will be credited to your MakeMyTrip wallet. The offer is valid only for Standard Chartered Bank customers. Each user can avail the offer twice in a month. The offer has to be used in single without combining with other MakeMyTrip promotional benefits. In case of cancellation of the hotel bookings, the customer will not be eligible for cashback offer. The offer is valid only at hotels listed under the deal. MakeMyTrip is not responsible for any claims associated with the bank. MakeMyTrip also provides wonderful gift cards, a perfect present for your loved ones. Choose a gift card of your choice as per your needs and purchase it online. The gift voucher will be delivered directly to the inbox of the given email Id along with the personalized message given by you. The gift card is easy to redeem. Choose the option “pay by gift card”, give the voucher number and the four digit pin to redeem the gift card. MakeMyTrip offering hotel, bus, and flight bookings at the best price also provides railway coupons. It provides the customers with the convenience of making the railway booking online without the hassle of standing in long queues at the railway ticket counters. The best part is you can get your train ticket at best price. Log in your MakeMyTrip account. Choose to make rail bookings. Give the required details such as departure and destination places, date of journey and the class. Click on the search train button to get the list of available options. Select the train that suits your requirements and make the booking. No coupon code is required to avail the offer as the customers are given the discounted prices. Make the payment.The offer is valid on railway bookings. If the customer cancels the railway booking then cancellation or penalty charges if any has to be paid by the customers. MakeMyTrip started in the year 2000 and provides online travel booking services. It provides international and domestic flight and hotel bookings, domestic bus and rail ticket booking service, holiday packages and few other partnering services in foreign exchange and travel insurance sectors. The MakeMyTrip mobile app lets you make the required travel bookings on the go. MakeMyTrip trip discount coupons help you get your travel tickets at the best price. The company serves its customers efficiently round the clock helping them in resolving queries or problems they come across at the time of booking or cancellation of the travel plan. It has a separate corporate program to help companies plan travel needs of their employees easily and economically. It provides secure online payment methods. MakeMyTrip bank offers save on your payments when you use the services of the specified bank. MakeMyTrip offers easy cancellation and refund policy. MakeMyTrip, India’s best online travel company was started in the year 2000 by Deep Kalra. The company has its headquarters in Gurgaon, Haryana. It was started to ease the travel booking process as well as to enable the traveler to know the available travel options without any hassles. The services offered by MakeMyTrip include international and domestic flight and hotel bookings, domestic bus and railway tickets, holiday packages and more at best price. MakeMyTrip discount coupons enable you to save on your travel expenses. Cancellation of the travel plan is also very easy at MakeMyTrip. You can cancel the complete booking or a part of it by providing the booking ID and the contact number provided at the time of booking. The refund will be credited to the corresponding account from which the payment was made. Customers have to bear the cancellation charges if any. MakeMyTrip retrieves any discounts or cashback provided at the time of booking upon cancellation of the travel plan.Apart from the various services, the blog section of MakeMyTrip provides interesting content that helps its customers plan their travel better. I Love MakeMyTrip, Each and Every Time I’m Using MakyMyTrip For Hotels Booking. I Got Rs.1000/- Discount Using MMTGO Coupon. Nice info. I thought egg is not that healthy for the weight conscious inulaiddvi. Hmmmm, got to try doing this thing. I need to add some weight in some parts of my body.